The Halstead Heritage Museum is located to the rear of The Queen's Hall, Chipping Hill, Halstead. It is manned on Wednesdays and Sundays from February to November each year between 1.30 and 4.00pm. In addition to a variety of local history related displays and artefacts we have an extensive collection of photographs of the area, some dating back to the 1800s. We also sell a selection of local History related books (you can also see these in the publications page of this website). Due to the size of the Museum we can only exhibit a small number of the many thousands of artefacts that we have amassed over the years. We try to update our exhibits as often as we can, and hold occasional exhibitions focusing on specific subject areas. Adapted from a speech originally given by the Society's Patron, Adrian Corder-Birch, at the opening of the Halstead Heritage Museum on 26th April 2009 and updated in January 2018. The Halstead Heritage Museum, located at the Queens Hall, Chipping Hill, Halstead is the latest, but not the first location occupied by Halstead and District Local History Society for a museum, since its formation in 1976. The history starts in 1980 when through the generosity of Evans Electroselenium Limited (EEL) the Society was given the use of 23 Parsonage Street. This was previously an empty cottage near the entrance to the former Evans car park. It consisted of two floors with a large ground floor room, set up as a museum, but it was never called a museum and was always known as the Headquarters. The opening ceremony took place in September 1980 attended by Arthur and Phyllis Evans, who travelled from their home in the Channel Islands, Ted Hall, also a Director of EEL and a Vice President of the History Society and our first President, Sir Ronald Long, who later became our first Patron. A few years later new management at EEL, by then called Corning Medical, asked the History Society to vacate its Headquarters because they wanted to convert it back to a dwelling for an employee. The Society then occupied part of the first floor of the former Kings Head Public House in Colchester Road for storage and some committee meetings' were held there. The occupation of this second building was only temporary until the Society moved into the Brewery Chapel, Adams Court, off Trinity Street in 1985. The Chapel was the first real museum and was known as the 'Brewery Chapel Museum'. This was conveniently situated near to the workshops of Halstead Retirement Industries who carried out much useful work in the museum including the construction of shelving and a new wooden floor. The occupation of the Chapel was made possible through the generosity of Halstead Town Council following lengthy negotiations between Adrian Corder-Birch and two successive Mayors namely Tony DeFrates and Michael Gage. The Town Council owned the freehold and allowed the History Society to occupy it at a peppercorn rent namely five pence a year. 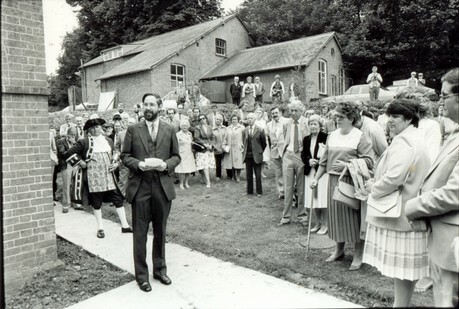 A grand opening took place in 1985 performed by Victor Gray, then County Archivist for Essex. The Brewery Chapel Museum flourished for many years with numerous different exhibitions relating to the history of Halstead and District. The Society was required to vacate the Chapel when the lease expired in 2006. The collection was then placed in storage at the former Town Council Offices at the Mill House in The Causeway, where there was significant storage space in the attics. 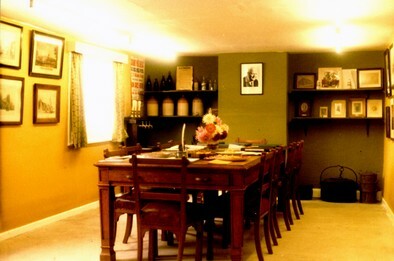 By 2008 the Town Council allowed the use of a room on the ground floor for a Museum and in April 2009, Halstead Heritage Museum opened and this location very proved successful. Unfortunately in 2016 Halstead Town Council were given notice to vacate the Mill House by early 2018, which included the museum. Following careful consideration the Town Council decided to convert part of the Queens Hall into council offices, a museum and storage area. The work was completed by late November and the museum collection was moved during December 2017. The museum was officially opened by Shirley Diver (Mayor of Halstead) on Saturday 3rd February 2018. 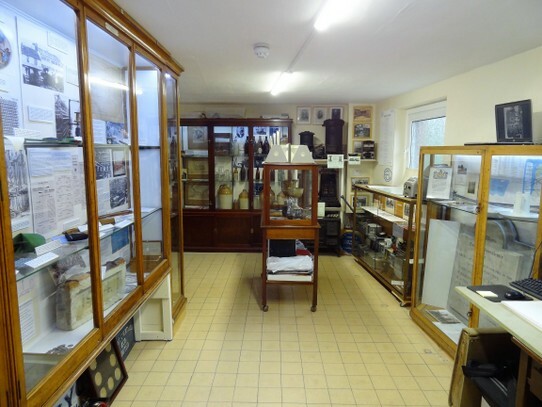 During the last forty years many members of Halstead and District Local History Society have been active in looking after its collections, including both archives and artefacts and also arranging exhibitions. These members have included Albert Cross, Alan Woodfield, Graham Slimming, Anne Stockill, Brian Turner, Penny Hill and Jim Davis. They have been supported with much practical hard work by staunch dedicated members such as Mary Downey, Doreen Potts, Doreen Middleton, Geoffrey Copsey, Percy Bamberger, Adrian Corder-Birch, David Baylis, Dave Osborne, John Miners, Andy Harris, Malcolm Root, David Tarbun, Jane Winch, Elizabeth Fall and John Walmsley. The Museum has also benefited from curatorial advice from Jean Grice and Robert Rose of Braintree District Museum. It is through the hard work, long and loyal service of these and other members that the collections of the Halstead and District Local History Society have grown and been preserved during the last forty years for the benefit of Halstead and District. The new Halstead Heritage Museum will continue in the tradition set during the last forty years. Under the guidance and encouragement of Jim Davis and other volunteers, the considerable value of this important resource will undoubtedly continue to grow and prosper.